Main feature of 4incentive is its logistics platform of the property. Each award is handed out from our warehouse multi. The ability to access a shared platform between the various ongoing initiatives has advantages in terms of speed of delivery of the premium and the economic competitiveness of the offer. In addition 4incentive invoice exclusively premiums demanded by customers without requiring minimum purchase. Each time you order a prize, the system checks the ownership of the points and notify the company sponsoring the successful request. Special care is taken in packaging and shipping of the prizes will be followed until it is delivered via specific procedures for tracking. 4incentive also provides the ability to customize the packaging of shipments with references to the company promoter and the insertion of tickets in bundles of congratulations. Each participant will be assigned a minimal threshold incentive to participate in the initiative, or may receive a target individual or group to achieve in a certain time. The points will be displayed in red color (not expendable) before passing the lens. 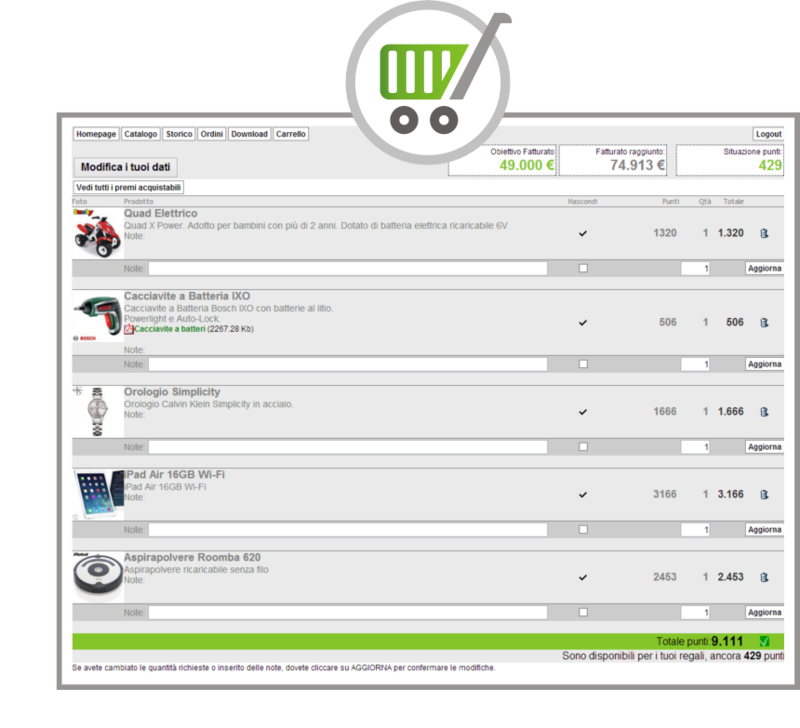 Only then the points will become green and give you access to cart multipremio. Let's talk about 'campaigns that are self-financing' because the delivery of the prize takes place only in the presence of growth in business volumes. Our shopping cart pluripremio allows the participant to order any number of items of merchandise categories also different as is the best e-commerce. This will make it possible to satisfy all family members abandoning the outdated concept of bands of prizes. The only drawback? The points available. Only major brands for exclusive emotions. The awards are exclusively 4incentive platform of brands and covering all sectors: electronics information technology, from household appliances to children's games, from jewelry to watches, from trips to the emotional experiences. To facilitate research articles have been broken down by category, brand and end points. The updating of the products is carried out weekly to guarantee a range of exciting prizes.